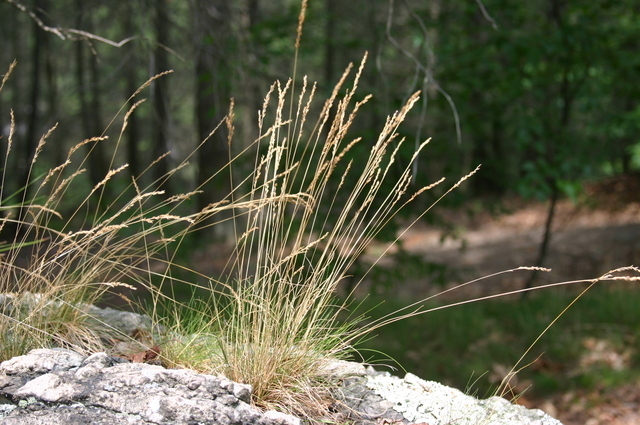 Festuca ovina.Les Mehrhoff.www.discoverlife.org (Accessed 5/2014). Festuca brevipila is a perennial C3 grass (Koukoura 1998), about 30 cm tall, densely tufted; flowering stems wiry, much longer than leaves, thin. Leaves alternate, basal leaves wiry, hair-like, dense, most much shorter than flowering stems, blue-green (Gargiullo pers. obs. ), blades very narrow, 0.05 cm wide, leaf sheaths of flowering stems open to base, margins overlapping, basal sheaths white. Flower spikelets 0.5-0.7 cm, 3-8 flowered, glumes unequal, lemmas short-awned; inflorescence rather contracted panicle. Habitat: Dry soil, open areas, roadsides, lawns, meadows, soil pH 5.5-7.5, tolerant of drought, moderately tolerant of fire, shade, intolerant of salt (USDA, NRCS 2010). Notes: a lawn and pasture grass.